Kazemon is a Fairy Digimon and a Champion-class Hybrid Digimon whose English name and design is derived from "Kaze" (風 lit. "Wind") and whose Japanese name and design is derived from the mythological Fairie. 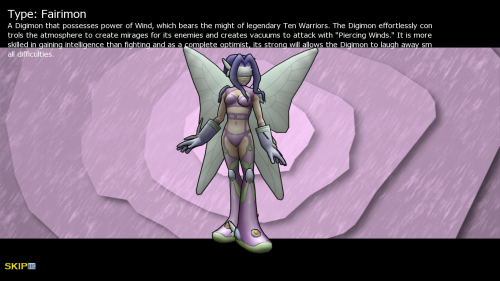 It is a Digimon with the power of wind of Ten Legendary Warriors. The Digimon effortlessly controls the atmosphere to create mirages for its enemies and creates vacuums to attack with "Piercing Winds". It is more skilled in gaining intelligence than fighting and as a complete optimist, its strong will allows the Digimon to laugh away small difficulties. Note: Spirits do not Digivolve, they have their own unique improvement system. Brezzo Petalo Wind attribute 4 seconds cooldown 66 DS consumed Learned at Lv. Fairymon throws tornadoes erupting from its fingertips to strike an opponent. Roseo Temporale Wind attribute 6 seconds cooldown 140 DS consumed Learned at Lv. Fairimon rapidly kick a close opponent with both legs. This page was last modified on 3 December 2018, at 19:31.